Some in the audience complained about Midgett’s lackluster performance and walked out, but enrollment in a UO class on underground film jumped from 63 to 350 after the phony appearance, according to Eduardo Reyes, who booked the October event. Morrissey explained to one reporter that Midgett had acted in some of Warhol’s films without getting paid, so they let him keep the tour money. Midgett (who now goes by “Allen Midgette”) continued to work intermittently as an actor and as an Andy Warhol impersonator. He currently lives in Woodstock, New York, where he is a fine artist. A recent interview with him can be found at the online magazine Chronogram. Archival footage from KEZI-TV, Chambers Communications Corp., Coll 427, FV34. Special Collections & University Archives, University of Oregon Libraries. Bishoff, Don. 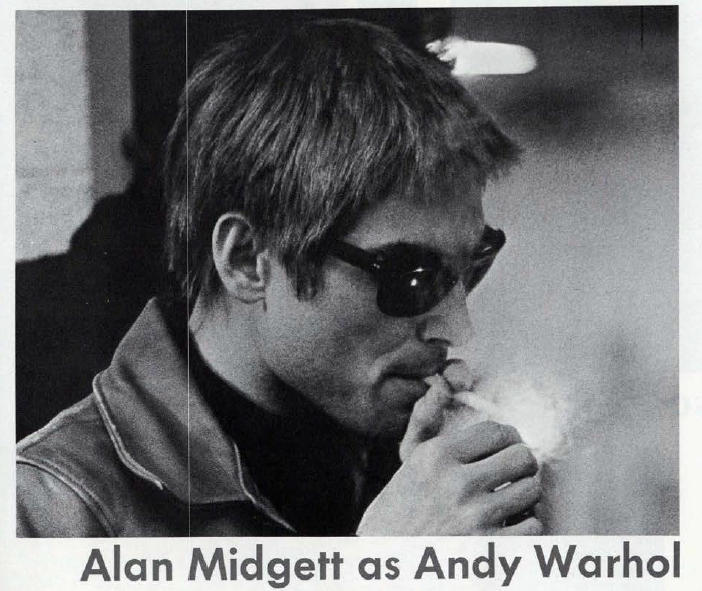 “No, Uh, Andy Warhol Wasn’t Always Andy Warhol.” Eugene Register-Guard, 24 Feb. 1987: C1. Bishoff, Don. “Real, Ah, Andy, Hasn’t, Ah, Much to Say.” Eugene Register-Guard, 22 Feb. 1968: B1. Raines, Howell. “Slated at UA, But…Will the Real Andy Warhol Show Up?” The Tuscaloosa News, 17 Feb. 1968: 20. At the same time Warhol actually came to U of O the Conference on Social Revolution was taking place. Those in attendance included Bernadette Devlin and Amiri Baraka. There does not seem to be any historical material available about that conference — which was very well attended and included many luminaries of the cultural and political left. I was a student at U of O at the time of the fake Andy Warhol talk and was in attendance. As I remember it, none of us thought for a second that the fake Warhol was the real Andy Warhol. He was forced to come back since sending someone in his place was a blatant fraud. As I recall, he made sure that he was less interesting than the fake. But we all thought it was all quite avant guard. A few years ago, I did see a show of his work at MOCA in LA. His images of iconic personalities and commercial products were impressive as I expected, but what I liked most was his earlier work. He was genuinely talented as an artist, and his vision and influence were important. It’s too bad he didn’t take advantage of the opportunity he had to provide better insight into his art.